Not far from downtown are the silhouettes of industries the city was built upon. In that first wave of industrial growth the coastlines were sharpened, tributaries confined, vistas obscured. The landscape became a background. Pierre-François Ouellette art contemporain presents Edward Maloney’s first solo exhibition in Toronto. This exhibition brings together three elements of the artist’s practice: drawing, video, and life-size installation – each chosen as alternative interpretations of realism. 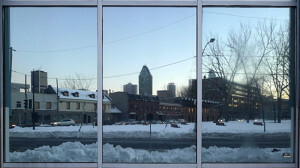 The central installation reconstructs a mirrored warehouse facade that integrates gallery visitors into a reflection of Montreal. 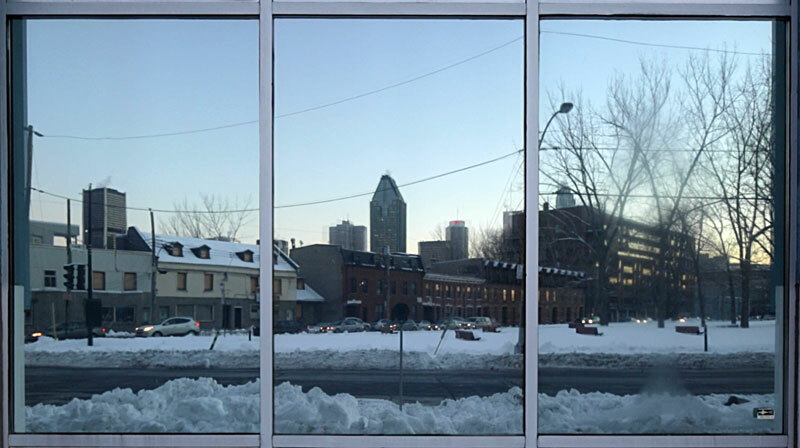 The 15 minute scene presents the skyline as an archaeological image from a historical vantage point in Griffintown. Accompanying this is a series of drawings using words from signage in the industrial areas of Toronto and Vancouver, playing with typographical and business motives, and complementing a single-channel video of North Vancouver seen though the shipping yards of Railtown. Industrial areas in cities show an early relationship to the landscape – governed by physical boundaries while demonstrating an ambition to extend beyond the water’s edge. In these renderings of historical city areas there is an organized abstraction of nature; from an environment into a collection of hurdles toward progress.